Part 2. Clock-in/out System: Basic backend — AuthModule. Part 3. Clock-in/out System: Basic backend — UsersModule. Part 7. Clock-in/out System: Deploy backend (nestJS) using docker/docker-compose. Part 8. Clock-in/out System: Deploy frontend (Angular 2+) using environments. this layer of my software :-). In our context, a routing is not required, because our frontend is not an SPA (OMG! So why are you using Angular then? Because this is a simple tutorial to show how to integrate NestJS + Angular). AppModule: This is the main module, which is responsible for launching the other modules. UserComponent: This component is used to add new users and their keys (it’s only for admin purposes, although there isn’t any security). TicketingComponent: This is the most important component, since this is the one which refreshes the screen with the information about the users who should be working in the building. Now, I’m going to show and explain each of the modules. MatTableModule: The table that will show the list of users which are in the building. MatInputModule: Form’s input that will be used to add the users-keys pair. RouterModule: This module will be used to load the clock-in/out and admin pages. FormsModule: This module is required to use template-driven forms in our project. 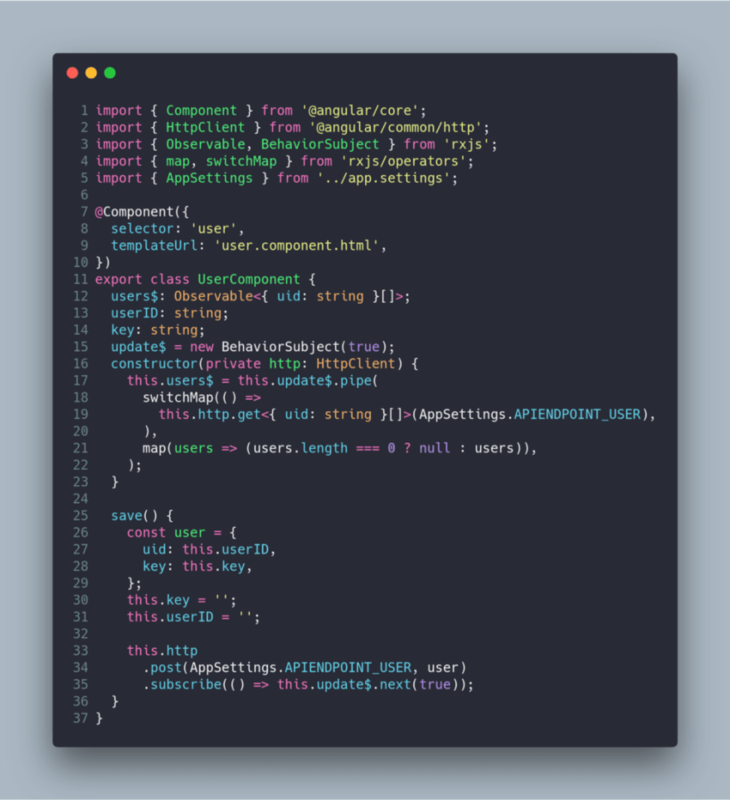 BrowserModule and BrowserAnimationsModule: These are the modules required to use Angular in the browser (and the animations). HttpClientModule: This module will be used to communicate the frontend and the backend using the HTTP protocol. will load our admin page (UserComponent). 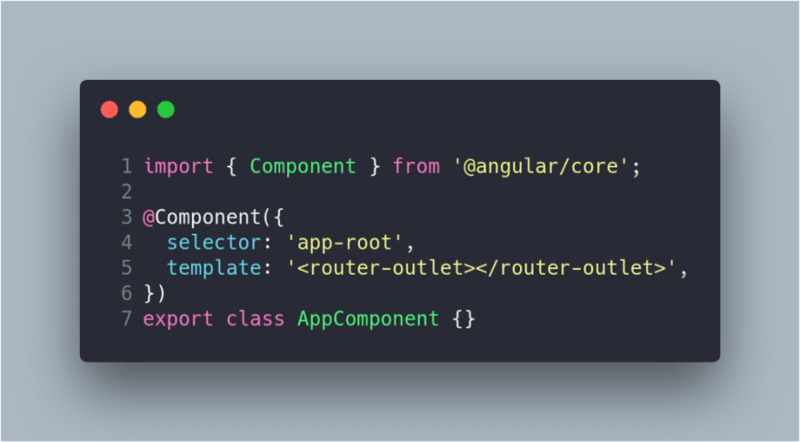 In any software we develop, we need different constants and environment variables, i.e, http://localhost:4200 is the traditional URI to develop an Angular app, although you need to change the domain or the port when you deploy your app. 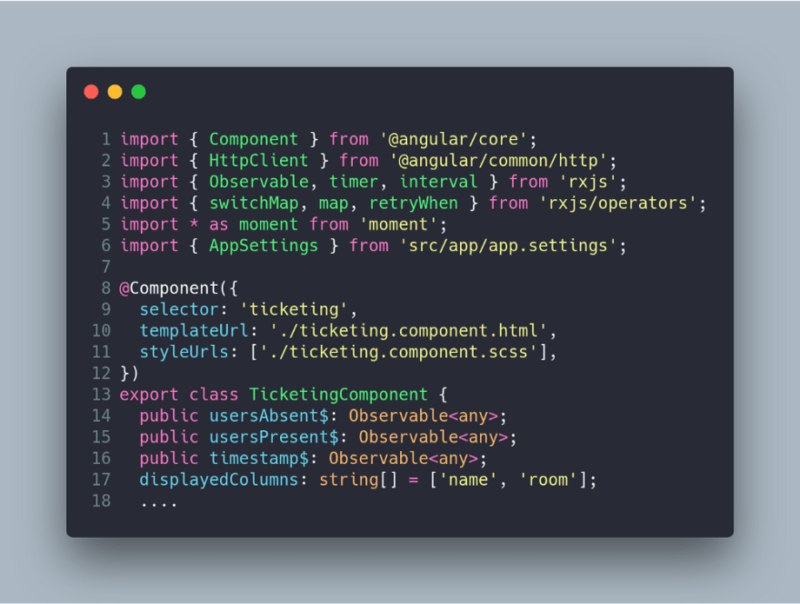 For this purpose, Angular provides us with configuration to change between different environments. constant is the APIENDPOINT which is provide from the file environment. 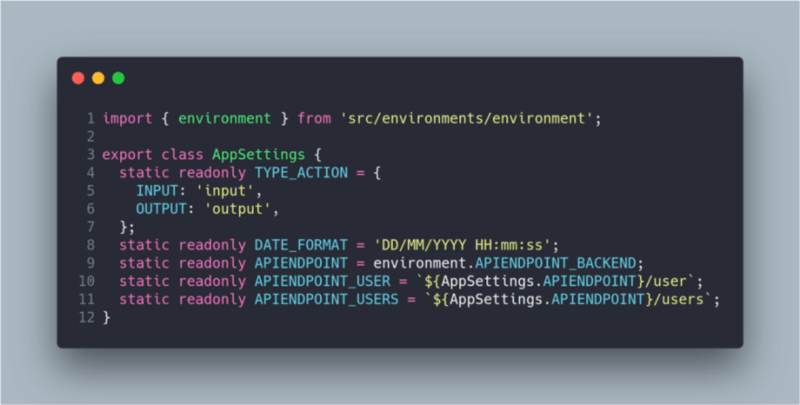 The only difference in the environment.production.ts file is the APIENDPOINT_BACKEND constant, which contains the name of the machine on which our app is deployed (In our case, a docker container). due to it having been developing using RxJSto make the system in near-realtime. 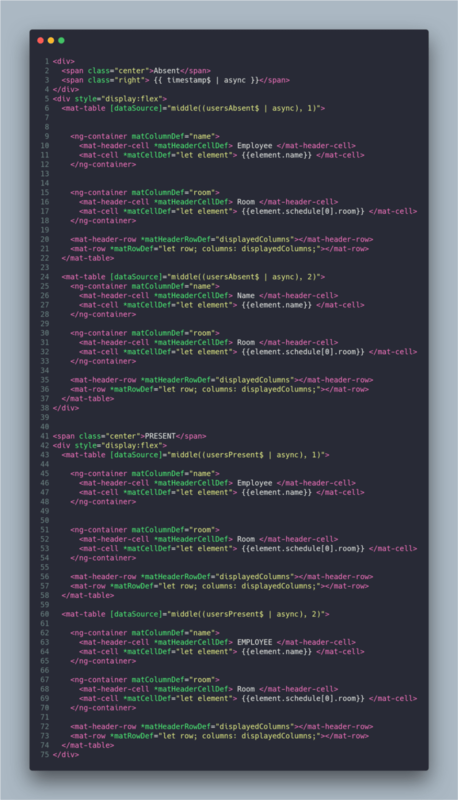 This example doesn’t use redux, so the double data-binding is used to refresh the template, from the logic part. This component’s template is the following. You may note that the template has several Observable$, which are rendered using the pipe async. For example, in the following code, the span tag redered the result of the subscription of the observable timestamp$. This pipe is a syntactic sugar for the traditional subscribe method. You can read more about this pipe in the official documentation. 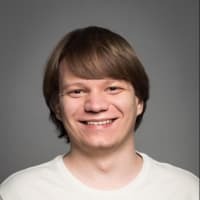 Other interesting point of the template is the use of the component Material Datatable which can received a set of data to be rendering in a table or an observable using the input [source] but in our case the Datatable will receive a set of data (after that the pipe async will do its job). Futhermore, the data are show in two different tables, so the data are separated in two sets using the method middle. 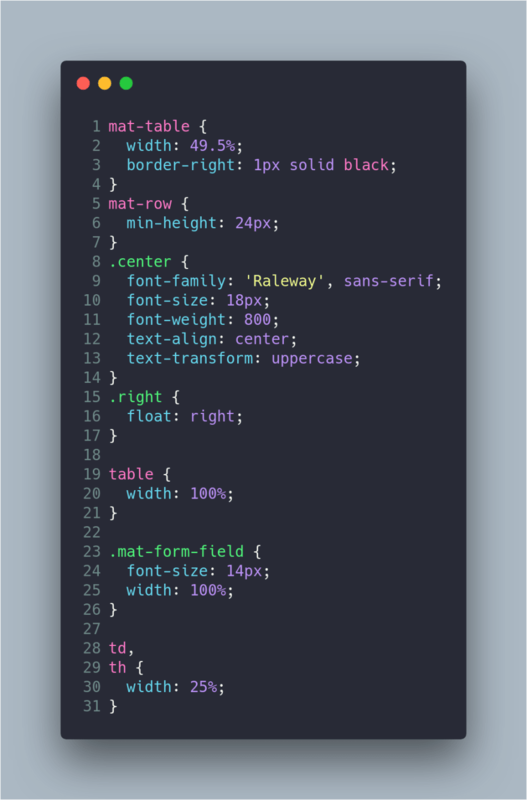 Our CSS file is simple, since it’s only styling our table (which must have a width of 49.50% and different typography size adjustments). usersAbsent$: This is the observable which contains the list of User which are not in the building. usersPresent$: This is the observable which contains the list of User which are in the building. timestamp$: This is the observable which contains the timestamp from the server. displayedColumns: The array of columns which will be shown in the table. 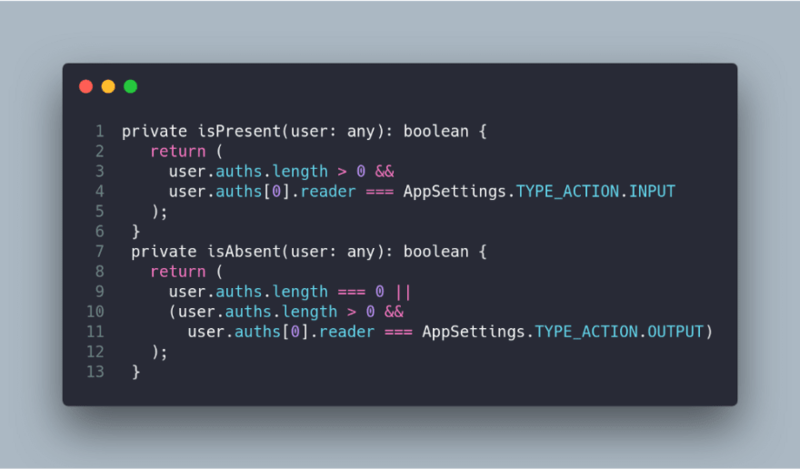 It is very important to remember that we’re using observables in our code to provide us with the power of stream’s manipulation by using the RxJS operators. 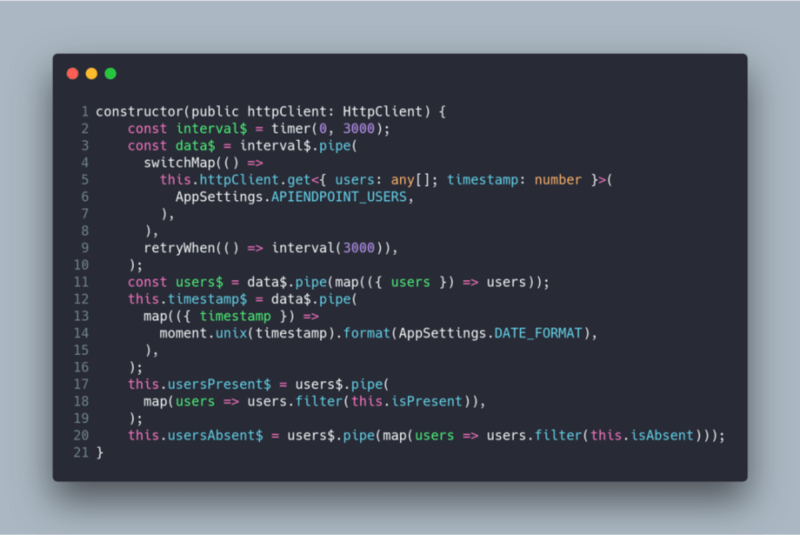 These observables are subscribed using the pipe async in the template. a http request using the httpClient service. The operator switchMap is used to cancel an unfinished request when a new request is made (to avoid several request being made at the same time). The operator retryWhen is used to handle the server errors. For example, if the connection is lost in the client or server you will need to retry again the request. So, when the code has an error, the request will be retried in 3000 ms.
Ok, now the observable data$ has a stream containing information about the list of users and timestamp. The observable users$ is created from the observable data$ which does a destructuration in each stream of data (this is the reason for the mapoperator being there). If you have understood the previous code, you can imagine how the observable timestamp$ is created. This timestamp is in unix format, we need to transform it to the DATE_FORMAT (DD/MM/YYYY). These methods basically check if the user has been authorized by the system, and whether the action is INPUT or OUTPUT. The last component of our basic frontend is the UserComponent, which is a simple form to add users and keys to our database. 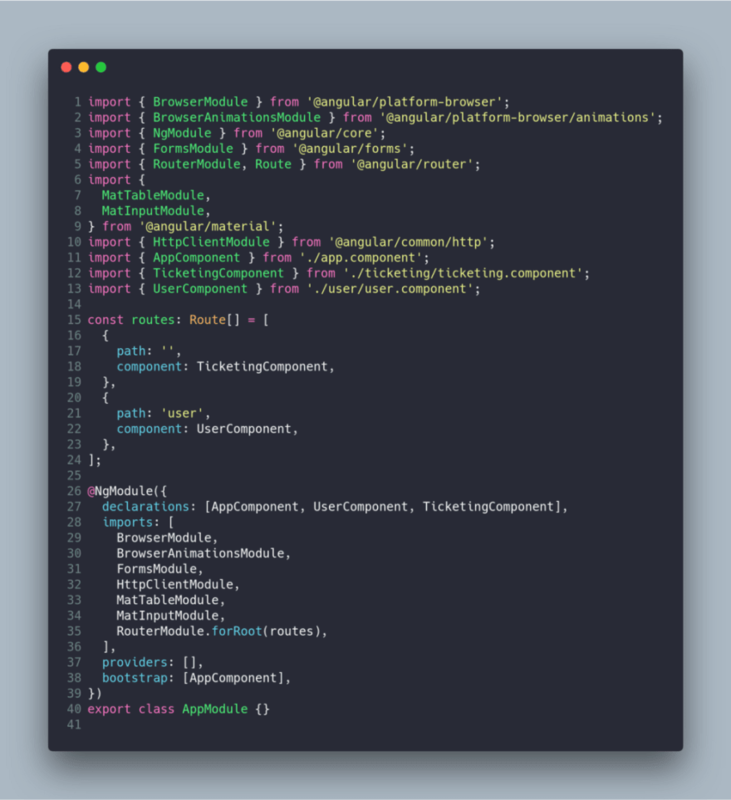 The idea to build this component is the same as the one used in the TicketingComponent. Therefore, the template to do the operation subscribes using the async pipe. The template uses the if-else of the ng-container to show a message when nobody has a key. Observable users$ which contains the list of users' UID. The string userID which contains the userID selected from the template. The string key which is the key that will be assigned to the user. Observable/Subject update$ which allows us to know that the action updated was done successful. The constructor is very similar to the constructor in the TicketingComponent, due to it recovering the list of users' UID from the backend, by using the switchMap and map operators. Finally the save method makes a request POST to the backend with the object that the backend requires to save the information. 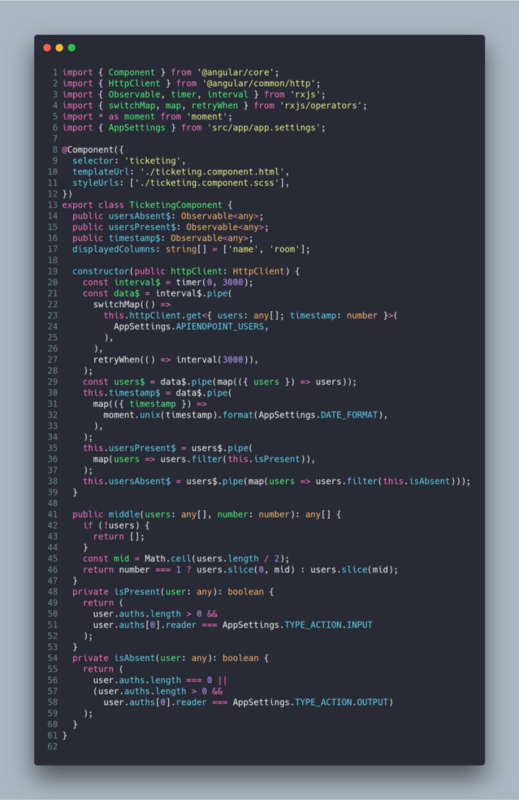 ‌In this post I’ve explained my basic frontend, developed with Angular and RxJS to ensure a near real-time system (using polling as the technique to connect with the server). The GitHub branch of this post is https://github.com/Caballerog/clock-in-out/tree/part6-basic-frontend. 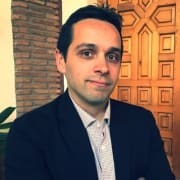 Originally published at www.carloscaballero.io on January 18, 2019.